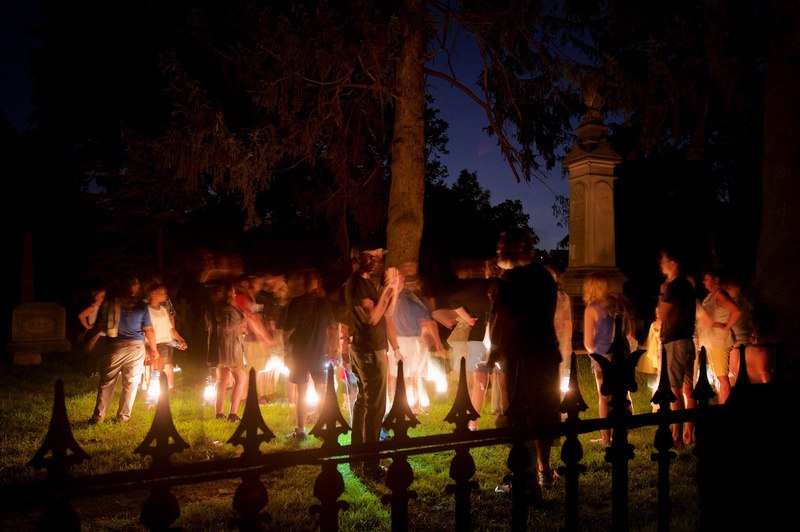 Explore the grounds of our beautiful 169-year old cemetery after dark by kerosene lantern light! Your guide will entertain you with stories about some of the most famous and fascinating people resting here in peace, as you soak up the unique atmosphere of being in a cemetery after hours. Dates: November 23rd and 24th from 7:00 - 9:00 p.m. Parking: Plenty of free parking is available inside the gate. Gates open approximately 30 minutes prior to start time. Skill level: Some people may find the pace of our two-hour walking tours challenging, especially in the dark. We cover more than a mile on foot and encounter stairs, unpaved roads, and hills. Please consider your own abilities when signing up for a tour. Refunds & Exchanges: All sales are final. No exchanges or refunds unless the tour is canceled. Tours leave promptly. If you arrive late and the gate is locked, no refunds will be given. Please check in no later than 15 minutes prior to the start time. Weather: Sleepy Hollow Cemetery walking tours run rain or shine. If we cancel a tour due to severe weather such as high winds, lightning, or heavy rain, we will promptly refund the ticket purchase price, less processing fees.